animal crossing needs a recording studio. I'd rather Animal Crossing remained original and didn't become over saturated with other Nintendo characters. We already have Smash for that, and now Mario Kart too. It's nice to have little cameos and easter eggs across the franchises, like Starfox nods in Majora's Mask and a pokeball as a planet in Mario Galaxy, but let's not get carried away. Having ganon as a villager is funny, yes, and getting it via amiibo makes it okay, but he's an already established character. Having him act civil in Animal Crossing goes against his entire character, which is alright as a small cameo, so I don't think he should be a consistent character in the world, just an extra. Last edited by Jezo on Mon Jun 05, 2017 11:00 am, edited 1 time in total. An e3 reveal would be lovely, but would have to be a 2018 release. New leaf was released back in 2012..blimey! are you still playing animal crossing new leaf also took a break again. I went back on it for a bit some time ago but got bored pretty quickly. Kinda regret resetting my original town, but that was a while ago. Only thing that's going to motivate me to start playing again is a new mainline AC game but I doubt we'll see one on the Wii U. I'll probably have a Switch by the time they release one for that though. did you have all fruits in your original town. I got all fruits in my town. Jezo are you still playing animal crossing new leaf. 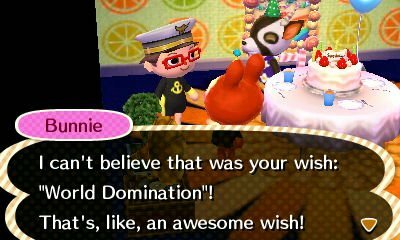 I don't think that's what you should be saying Bunnie. In fact, you should probably slowly start to back away. I got that when I went on yesterday. One more year until the great milestone of five years. i have to play acnl again to get that clock do it later. have you complete the medals. what did you complete in acnl. I think this thread can be locked now. No incase a new animal crossing comes out. We can chat about it here plus still got the mobile game to come out too. Pretty sure it was a joke 'cus of Fisher's posting three times in a row and no-one replying back. At the minute though, I'm pretty sure we're all just waiting on more news. New Leaf feels as though it's faded from most people's minds, which might have something to do with an HD handheld game sure to be releasing soon [we hope]. Yeah the series really does need a new game, as fantastic as New Leaf was (and still is I suppose, if you're late starting to play it) it's 4 years old now, that's amazing in itself as its flown by. A mainline Animal Crossing on the Switch should be fantastic once it happens. The 'big' update to New Leaf constituted a new release of the game, so chances are it was a way to hold the fans for a few more years. I still play it pretty often, still got things to do in the game, so... Don't forget we got that mobile game next year tho.